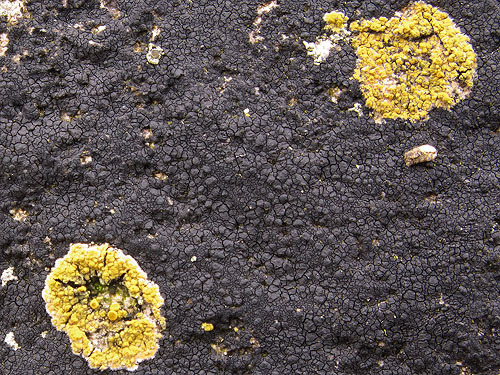 Black Tar Lichen - "Verrucaria Maura". Black tar lichen is a smooth, black, crustose lichen found on just about all rocky shores but especially more exposed shores where it can cover huge areas of coastal rocks in a thin layer, making them appear as though they have been covered with dull black paint. A close up view reveals a lichen with a textured surface .